I - Movie Critics Review | Colourful..Terrific..Mesmerizing.. Home » Amy Jackson | I | Review | Shankar | Vikram » I - Movie Critics Review | Colourful..Terrific..Mesmerizing.. After loads of expectations, the opulent I is finally here and is all set to set the screens ablaze with awe inspiring technical work from a crew who can move mountains. Breaking free from his comfort zone of movies typecast with social messages, Shankar steps into a romantic action genre that integrates an interesting plot and an actor par excellence. Vikram is Lingesan an ardent body builder whose daily routine and lifetime ambition is capturing the title Mr. India. He also worships the suave and beautiful model Diya essayed by Amy. Shankar takes the journey of I by taking enough time to establish the characters, even though the movie chugs along predictably. The movie shifts between two timelines, one of that the hunchback on a vengeance spree and the other with Amy Vikram Jodi completely shrunk in love. All is well when things start going haywire with the sudden turn of events. Shankar trots between the timelines rather predictably more than once, but still manages to keep impressing. Aila aila is an array of colors and ecstasy,, Shankar's signature all over. I is indeed a perfectly made magnum opus tale of love, jealousy, revenge and passion. A terrific performance let down by an uninspired, exhausting movie. Amalgamation of Masters at play, Watch it for Vikram ! Simply Awesome! Love, Revenge: Vintage wine in new bottle. I is not the best of Shankar, but still it is a one-time watch. Below, we bring you the tweet Reviews of the movie goers. #I interval - Shankar magic happening big time, not bored even a bit. Watched #I..I donno guys bt I feel Msia cut the movie 2 much. Story as expected but Chiyaan was out of the world! @rameshlaus : all revenge n fight scenes r cut. We were totally blurred until audience shouting in disapoinment! The best thing I liked in #I is @iamsanthanam 's comedy. He made the entire crowd run ROFL! Oh yeah, Shankar used all Amy's ability to maximum. Exterior & Interior #I mean. She was so hot in pink bikini body! Since many scenes cut, we cannot feel the mersal effect enough tough in Msia! All in & out, @shankarshanmugh the king of #I made yet another exceptional but MASSIVE EPIC movie for Indians! Not to forget, this #I is definetly not for children. Too much glamour & double meaning scenes. @inaymusic On the whole, my rating for #I: 4.5/5. GO FOR IT! Time flies! The movie is THRICE watchable! You'll broke in tears at the end! 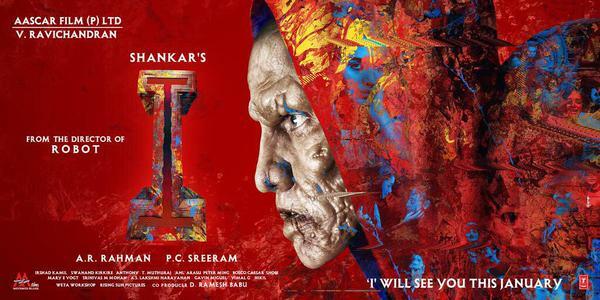 #I goosebumps allover... Scintillating stuff from shankar...out of the world thinking!!!! 'I' One word AMAZING! Director Shankar nvr fails to mesmerize wt his colourful picturization & cinematography graphics. Movie was worth the watch.